HCM CITY — Vietjet Aviation Joint Stock Company will list 300 million shares on the HCM Stock Exchange (HOSE) in late February after it managed to retain an approval for the same. The company will be listed with the code VJC at the opening price of VNĐ90,000 (US$4) per share. With the daily trading limit of 20 per cent on either side, the aviation company’s share price could range between VNĐ72,000 and VNĐ108,000 per share. On the opening price of VNĐ90,000 per share, Vietjet’s market capitalisation is VNĐ27,000 trillion, equal to $1.2 billion. Vietjet did not clarify the date of share listing in its financial prospectus; however, a source told local news site zing.vn late Thursday that Vietjet’s shares would be traded at HOSE on February 28. On January 25, Vietjet registered its 300 million shares with the Vietnam Securities Depository. 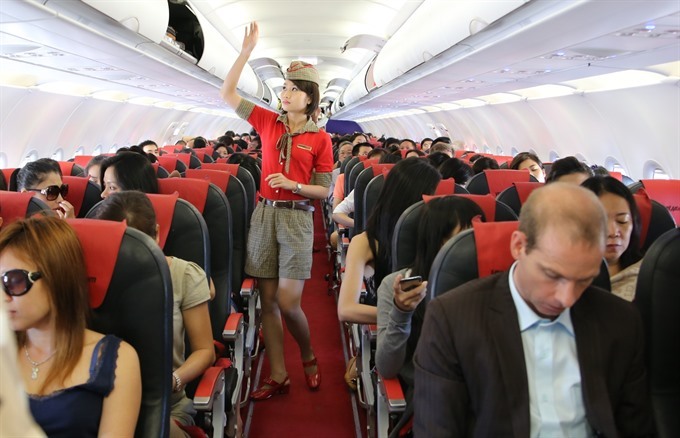 According to Reuters, Vietjet Air has sold 44.8 million shares of current shareholders to institutional investors at VNĐ84,600 per share, and 3.5 million shares to individual investors for VNĐ86,500 per share. About 30 international corporations and investment funds have offered to purchase Vietjet’s shares, including Morgan Stanley, Mirae Asset, Dragon Capital and VinaCapital. According to a recent report by Vietnam Enterprise Investment Limited (VEIL) run by Dragon Capital, the investment fund on January 19 owned $43 million worth of Vietjet shares. Besides VEIL, HCM City Securities Corp (HSC) also spent VNĐ134.5 billion to buy 1.6 million of the carrier’s shares. Shareholders of Vietjet Air have also approved the company’s proposal to issue more than 22.3 million shares to the Hướng Dương Sunny Investment Co. Ltd in the first quarter of 2017 at a price of VNĐ84,600 per share. The share issuance will increase the aviation company’s charter capital to VNĐ3.22 trillion. In 2016, Vietjet received a net revenue of more than VNĐ27.5 trillion, a year-on-year increase of 39 per cent from 2015. The figure includes an amount of VNĐ15.5 trillion from passenger transportation and related activities, and an amount of VNĐ11.7 trillion from transferring and renting of planes. The company’s combined pre-tax profit reached VNĐ2.4 trillion. The post-tax profit for the parent company’s shareholders was VNĐ2.29 trillion, equal to earnings of VNĐ8,726 per share.